The saying ‘bold as brass’ could not be more appropriate for this unashamedly brazen ring. 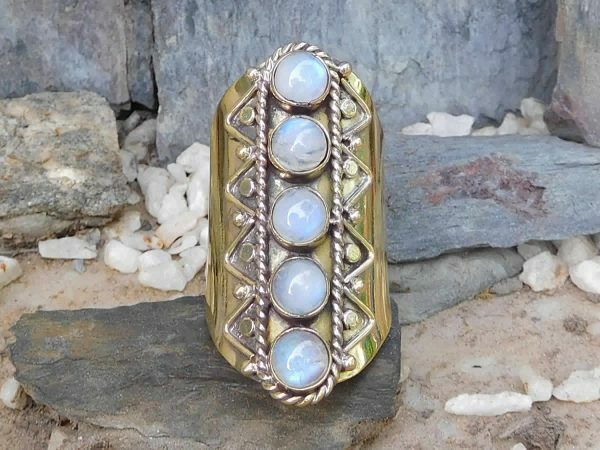 With a long 40mm shank, hand-crafted in nickel-free brass and inset with five light-catching rainbow moonstones, this is sure to be a crowd pleaser and teaser. Not for the feint of heart or little fingers. Ring size: Adjustable (from 20mm). Stones: Natural rainbow moonstones 4mm diameter each.